The effect of a nuclear explosion depends on many factors, such as the size of the bomb, what it's targeting, and what the wind is like. NUKEMAP lets you experiment with all kinds of nuclear scenarios using stats for different known nuclear weapons, mapping out which areas would be burnt to a crisp, and which would just be blanketed with radiation. You can get an estimate of the death count, how many local schools and hospitals would go down, and how today's weather would affect the fallout. You can use NUKEMAP's sister site MISSILEMAP to choose from current and historical missile launch sites. While you can use this tool to imagine, say, a French bomb taking out Sydney, most places in the world are unlikely to ever be nuclear targets outside of an all-out global nuclear annihilation (in which case some of us might rather burn up in the first attack instead of struggling on after the apocalypse). A 2015 panel of nuclear experts estimated that the highest current nuclear risks are in India, Pakistan, the Middle East and the immediate surroundings of North Korea. Australia is highly unlikely to be on any rogue nations' hit list - we're too remote and unimportant for that - but what about our allies in the USA? Those living in the continental US aren't in range of any successfully tested North Korean missiles. Last May The Washington Post said even an attack on Hawaii would be "a stretch". An attack on the US from a country with global capability - and minus longterm allies, that's just Russia or China - would likely target the US's own nuclear strongholds, which are mostly located in sparsely populated areas for exactly this reason. 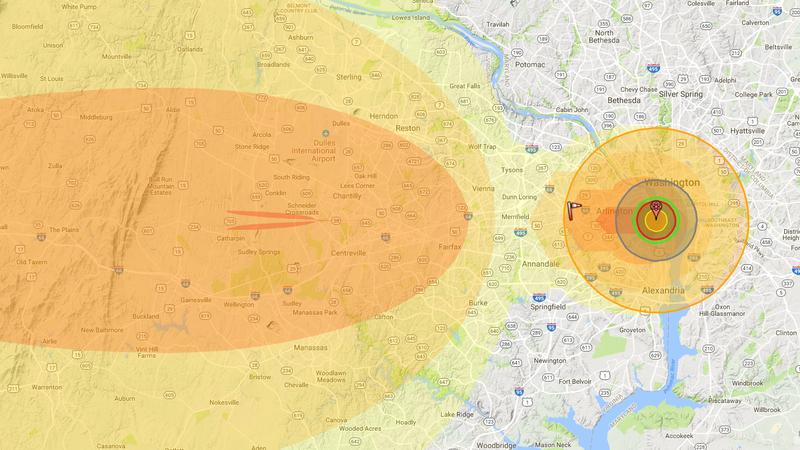 But other key military targets are near population centres; the Pentagon, pictured above as the epicentre of a strike from a Russian ICBM, is right in the middle of Washington, DC. To avoid retaliation for an attack like that, any strike on the US or its allies would need to take out the entire US nuclear arsenal, including the missiles deployed on submarines in secret locations. Since this is nearly impossible, there's good news for most people: While several countries theoretically could blow up your city, none of them especially want to.